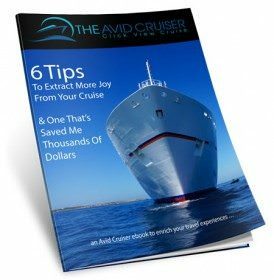 Once a year in late August or early September, a few cruise ships cross the Atlantic from northern Europe to Canada, repositioning from the Baltic Sea and/or Norwegian fjords to eastern Canada and New England for the fall color season. 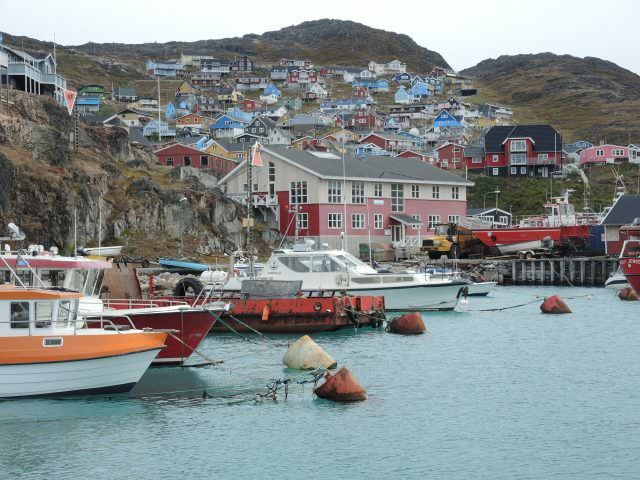 Many of their itineraries include a brief visit to the southern tip of Greenland. This is an experience that is especially spectacular, as the mountainous shores and indented fjords are almost unearthly in their starkness. 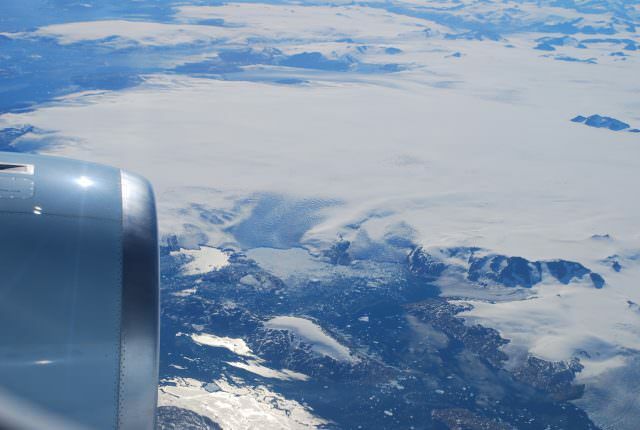 Many of us have flown over Greenland on routes between North America and Europe, and we have seen the massive ice sheet that dominates the land, a reminder of the last Ice Age. 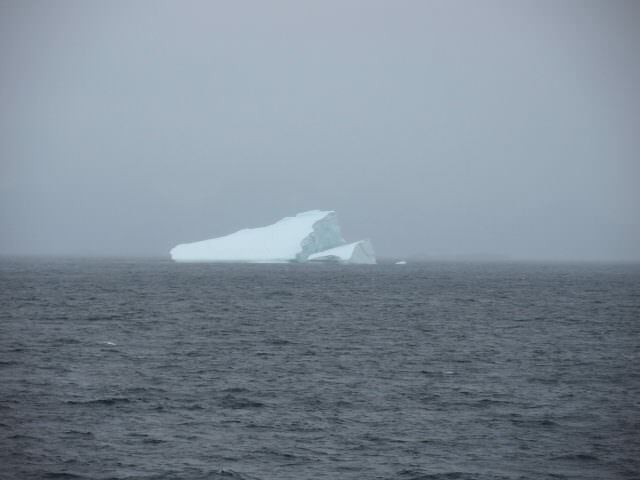 Seeing the landscape from the deck of a ship is another experience, though only the outer margins of the great icecap are on occasion visible. Greenland as we normally see it flying between northern Europe and eastern Canada or the U. S.
Greenland is the world’s largest island at 2,166,086 square kilometers or 836,330 square miles. It is so large that on the most commonly used world maps in the Mercator projection show it as being larger than South America when in reality it is only 14 percent as large. For many of us, our first lesson in geography was to identify places around the world using this horribly distorted projection that maintains shape but grossly exaggerates shapes the farther north or south of the Equator. And yes, Greenland is very far north. It is for the most part covered by a massive continental glacier, rendering all but the fringes of its more southerly shorelines as marginally inhabitable. The total population, mainly native Inuit, is only 56,500. Today we read or hear dire warnings that the great Greenland and Antarctic ice caps are melting rapidly, causing a rise in sea level. The world is undergoing a more rapid rise in temperatures, especially in the polar regions, in good measure because of human industrial activity that is increasing the levels of carbon dioxide and methane in the atmosphere. The earth has undergone totally natural rises and decreases in global temperature before, but today’s increases have a human fingerprint. Yet over 1,000 years ago when the Vikings first attempted to settle on the shores of Greenland, they were able to engage in limited farming, something not possible at present. Perhaps continued warming will make the margins of Greenland more habitable. 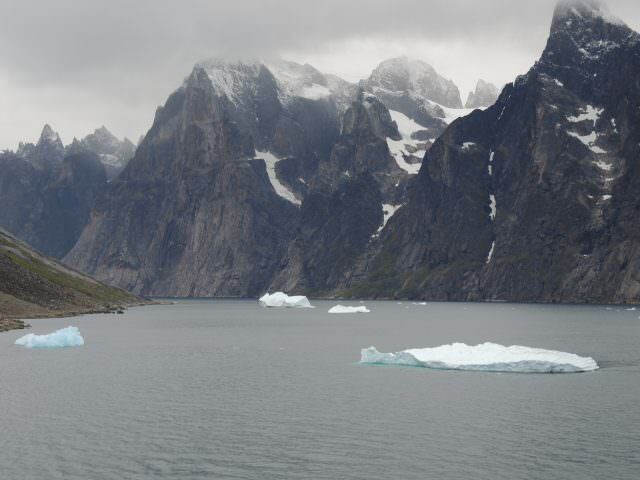 I have visited Greenland twice on the Silver Whisper, cruising through Prince Christian Sound and stopping at the villages of Quqortoq and Narsarsuaq. The experience was exhilarating and in many ways almost surreal. There is almost no vegetation cover, save for a few small hardy shrubs and grasses, categorizing the entire exposed land surface as tundra – devoid of trees. The great ice sheet is for the most part hidden from view by the outer mountain ranges on both sides of the island, but glacial tongues do reach the sea along the many fjords that were cut by ice during periods of glacial advance. PRINCE CHRISTIAN SOUND is technically not a fjord. It was carved by the confluence of numerous glaciers descending from the interior ice cap. Today the sound separates mainland Greenland from several large islands that were detached from the mainland by glacial action. It takes half a day to cruise through Prince Christian Sound. It is a deep channel but in a few spots is less than 500 meters wide. 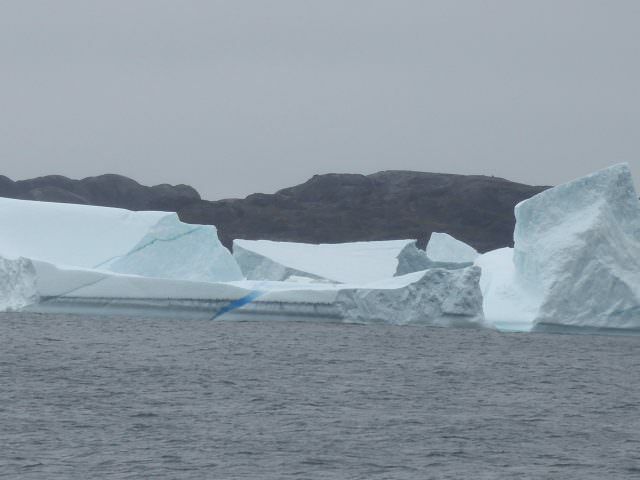 A Greenland pilot is on board to guide the ship through, as the changes in width, various currents and a large number of icebergs that range in size from small to massive make navigation difficult for the uninitiated. The weather is always the unpredictable factor. It can be foggy, cloudy, rainy or brilliantly sunny, though the latter is less likely. If visibility is good, the rewards are enormous. 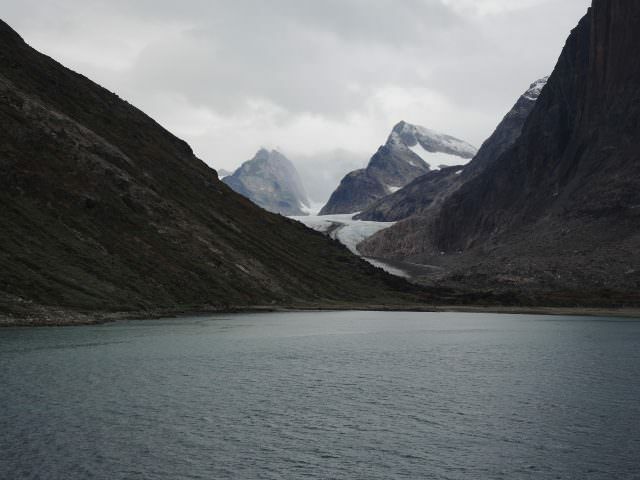 Sharp edged mountains appear to rise abruptly from the water, and small ice fields can be seen on the more gentle slopes. Glaciers protrude along what were once river or stream channels, their massive blue ice walls rising hundreds of meters. And the sound is filled with the remnants of the continual calving of these glaciers during the warmer summer months. Depending upon winds, currents and temperature, there are times when the channel becomes so clogged with ice that it hinders transit. There landscape gives one the feeling of being on another world, as if one has been transported to another planet almost devoid of life. I found the experience to have a very positive ethereal quality, as did many other passengers. On occasion the sighting of a sea lion, whale or dolphin brings the viewer back to the reality of this earth. 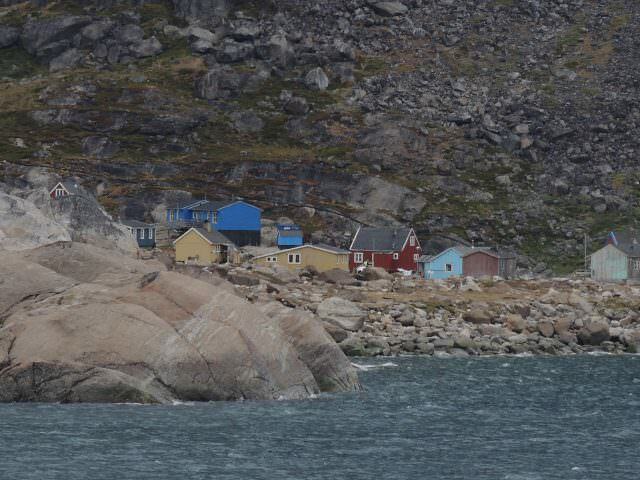 And in the entire 100-kilometer passage, only one small Inuit village called Aappilattoq is passed. It has no road access and is totally isolated from the outside world, but it is home to around 150 people who survive by hunting and fishing. It does have limited helicopter contact primarily for carrying in goods and exporting its catch. NARSARSUAQ is a very small town of less than 150 residents, mainly Inuit, located along Tunulliarfik Fjord across the water from one of Erik the Red’s settlements dating back to the year 875 AD. However, Narsarsuaq was established by the United States Army Air Corps, as a refueling stop en route to the European theater of war. There is not a whole lot to see, but just walking the town gives you the sense of isolation combined with the harshness of the land, making life so precarious. 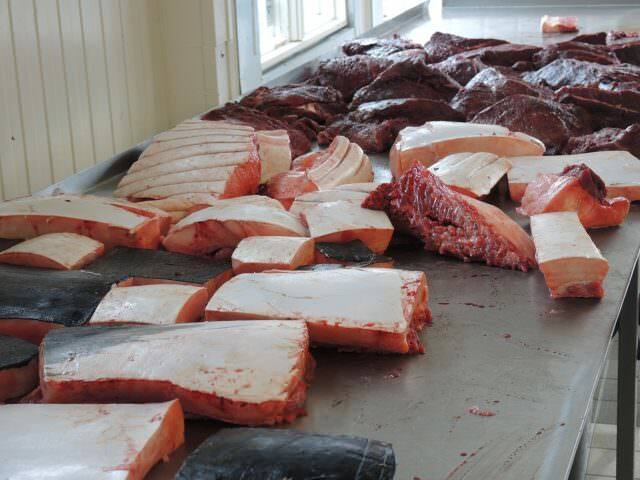 A visit to the local fish market is quite an eye opener because the main source of protein is whale meat, and blubber provides the added fat so necessary in this cold climate. Despite the bleak conditions and lack of trees, there is no loss of color, as the houses of Narsarsuaq are brightly painted and do perk up the otherwise drab landscape. Yet the drabness of the surroundings remind you this is Greenland, the world’s largest island still primarily buried under a massive crown of ice. My husband was stationed in Greenland in 1954-55 with the USAF. It was considered a hardship tour so it was only for a year. He was at Thule first and then moved to Narsarsuack, which was jokingly called the Florida of Greenland by the airmen because it was a little warmer in the South. Besides the frigid cold in winter 60 below with winds strong enough to flip a road grader end to end, Because of its location on the globe you have months of darkness in the winter and months of daylight in the summer. Because he was in Rescue, he got to do lots of crazy things as a young man of 22, even spending some time on a coast guard ice breaker in heavy seas. Nice story. I’ve been three times, and long to return, but I didn’t have to endure hardships. Lovely place – and melting unfortunately. Ralph, undoubtedly it is quite different now. Plus, he was there for a year and had to work. He took lots of photos which showed a very bleak landscape. 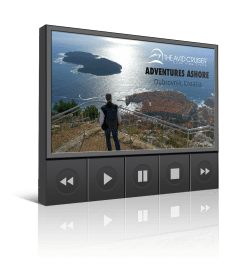 One sees things differently on a vacation trip or cruise and so you should. What a great story. The romance of a time and place long gone. Thanks for sharing.